Patients with Alzheimer’s disease need healthy routines just as much as anyone else. But it’s not always easy for them to plan their days and complete certain tasks. That's where caregivers can help. The National Institute on Aging (NIA) encourages caregivers to support patients with Alzheimer's disease in daily routines that involve food, music, exercise, games and even cleaning. 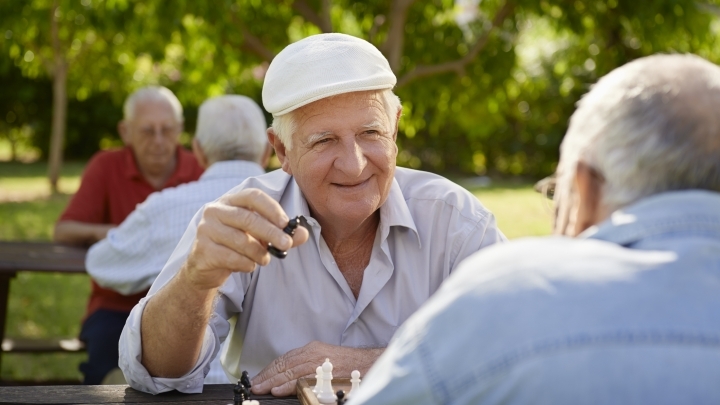 An active lifestyle that includes activities and exercise can benefit patients with Alzheimer's disease. In addition to enhancing quality of life, activities can reduce behaviors like wandering or agitation. Alzheimer's disease is a brain disorder in which patients develop memory loss and struggle with thinking skills. As the disease progresses, patients may have difficulty carrying out the simplest tasks. It is the most common form of dementia, according to the Alzheimer’s Association, and accounts for up to 80 percent of dementia cases. Although it's not just a disease of old age, the disease is more common in people older than 65. A progressive condition, Alzheimer's disease worsens over time. There is no cure, but some treatments can help with symptom management. As the disease progresses, patients need more intense supervision and care. A daily routine provides stability. Change is often stressful, even to people who don't have Alzheimer’s disease. The Alzheimer’s Association notes that a regular routine makes it easier for both the caregiver and the person with Alzheimer’s. Structured activities may reduce symptoms of agitation and improve the patient's mood. It is recommended to promote regular sleep hours. When developing a plan, consider the individual's likes and dislikes. Make sure to allow ample time for basic activities like eating and dressing — and build in rest periods, too. As Alzheimer's disease progresses, the abilities of patients will change. As a result, the caregiver will need to adapt the daily routine to support these changes. Exercise can help people with Alzheimer's disease stay flexible and strong. It also helps promote heart health and can improve sleep. As a caregiver, you'll need to develop the routine and supervise exercise — something a doctor can help with. People with Alzheimer’s may have trouble staying focused or may exhaust themselves. Short, frequent bouts of exercise are often best. Simply going for a walk may be one of the best ways to exercise. Other possible activities include dancing, tossing a soft, rubber exercise ball, or doing household tasks like sweeping. Like all people, patients with Alzheimer’s disease have good days and bad days. Be prepared to introduce another activity or take time to rest if you see signs of agitation or fatigue. As the disease progresses, it may take more time to complete an activity. Always consider the safety of activities when someone has Alzheimer’s disease, and always supervise. Reach out to a medical professional with any and all questions.